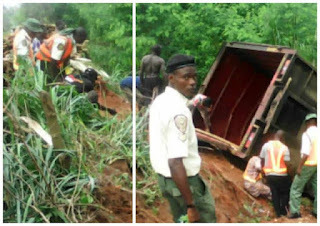 Samuel Gbanyge, the driver of the truck which fell into a ditch around Remo area, inbound Sagamu, Ogun State, yesterday, said his accident was caused by some unseen forces battling the steering with him. According to Samuel, battle with the forces led to the loss of control, which resulted in the death of one of his co-travellers with the other sustaining injury. Samuel, and the other passenger sustained serious injuries before they were rescued by emergency responders, including officials of Ogun State Traffic Compliance and Enforcement Corps, TRACE.